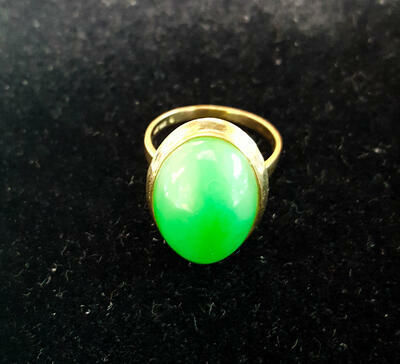 Estate Jewelry… What is it? Estate jewelry is everywhere. In fact, most people own some kind of estate jewelry and don’t even know it: That old necklace you got from grandma? Estate. The necklace you bought at a garage sale last year? Estate. The ring you plan on passing down to your daughter? Soon to be estate. Estate jewelry is basically just a fancy phrase for any piece of jewelry that was previously owned. 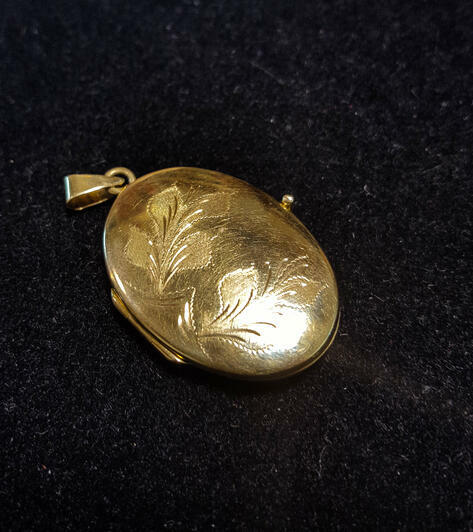 There are three main types of estate jewelry: Art Organique, Vintage, and Antique. These three types essentially categorize estate jewelry by age. Art Organique describes jewelry from the 20th century to now. 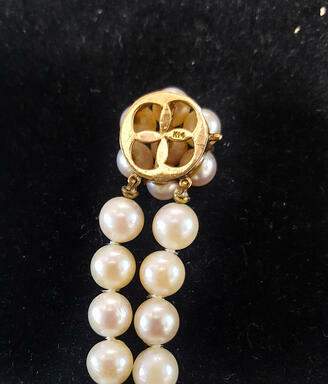 Vintage characterizes jewelry that is at least 20 years old. 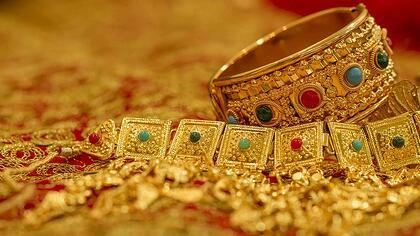 Antique refers to jewelry that is 100 years or older. (Or, at least in the United States it does. Countries with a longer history, Britain for instance, define antique as even more than 100 years old). Note: These three categories are general umbrella terms for the different periods that estate jewelry can be from. There are many more specific time period categorizations for jewelry (Georgian, Late Victorian, Retro, etc). So, if estate jewelry is so common, what’s all the hype about? This: some estate jewelry can be extremely valuable. If you happen to come into possession of a piece of estate jewelry from Queen Victoria’s court, it’s going to be worth a good fortune, to say the least. The tricky part of identifying estate jewelry, is being able to tell which pieces are valuable and which are junk. This is done by classifying the who, what, and where of the jewelry piece. It may sound like a lot, but if you know what to look for, evaluating your estate jewelry is a piece of cake. Checking the quality of the jewelry is the first and easiest part of the job. The point of a quality check is to determine what the current condition of the piece is and whether the jewelry piece was well-made to begin with. Both of these factors play a big role in the jewelry’s value. First, check if the jewelry piece has any breaks or cracks. Be sure to really turn the piece over in your hand, examining it from all sides. Notice how this pendant has some scratches, but is overral intact. Conducting a general quality check is pretty straightforward, a simple cosmetic evaluation. You don’t need a magnifying glass for this, but if you have one lying around it can be a good idea to use it. 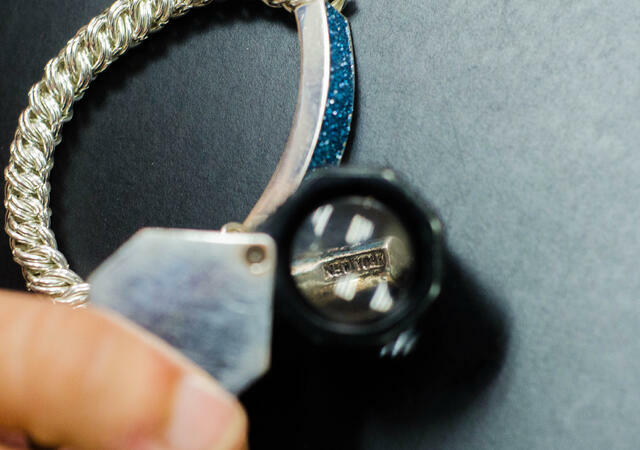 A magnifying glass will give you that extra edge in examining your jewelry because it allows you to really see if there are any small discrepancies in the jewelry’s surface or core. Having any sort of cracks or damage can really bring down the value. You won’t be able to come up with an exact price just by looking at the condition of the jewelry piece, but looking it over is important for giving you a general of idea of what you are dealing with. For Instance: If a bracelet is falling apart, with broken links and a missing closure, it's going to be worth less than if it were in mint condition. No one is going to be able to wear it, and unless it is some sort of relic, no one is going to be showcasing it either. If it is a real metal, you could melt it down for a profit. But at that point you aren’t really selling the bracelet for its innate jewelry worth, you are selling it for purely for what it is made of. 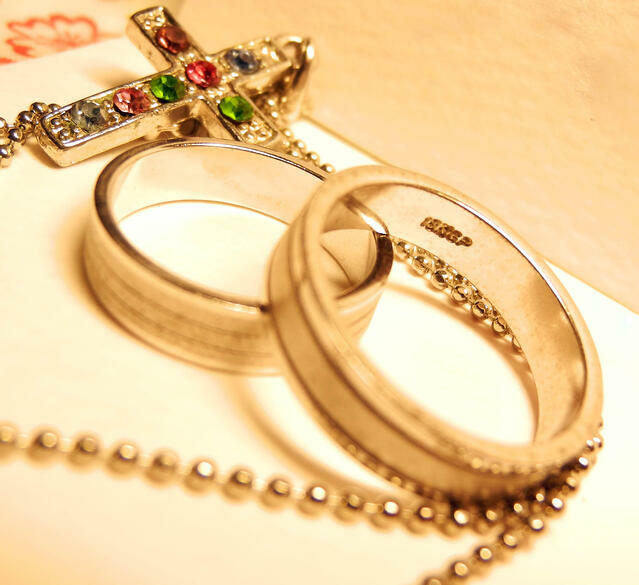 As you can see, the condition of the jewelry has a major role. The next thing to look at is whether there are any stamps on the jewelry piece. Stamps are generally located on the backs of jewelry pieces. However, if you don’t notice any there, then be sure to look all around. 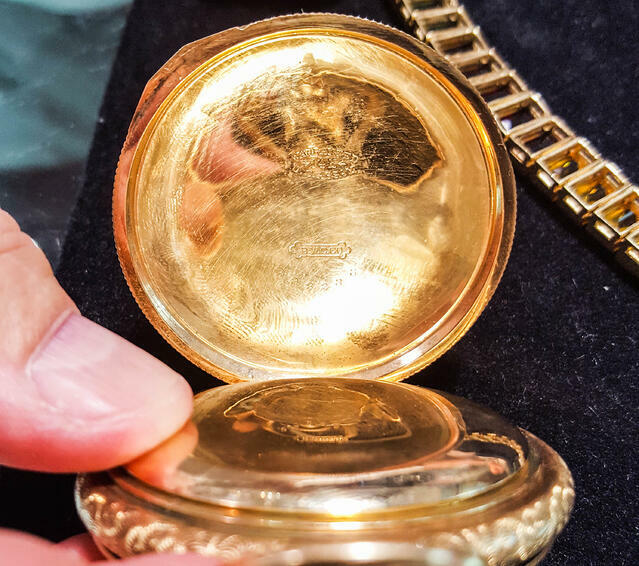 The signature and stamp for this pocket watch is actually located inside the cover of the watch. Stamps are a sure jewelry identifier. If you can locate one and decipher its meaning, you will learn a lot about the jewelry piece. Not just assumptions about its value, but real, concrete information. There are many types of stamps, each indicating a different element of information. Maker’s mark: The maker’s mark is essentially a stamped quality control marker. The symbol can be either from the original crafter or from a firm/manufacturer tasked with guaranteeing the quality of the piece. Purity mark: This indicates the precious metal content of the piece. Purity marks are ratios, with the number mark usually being X parts out of a thousand. Date mark: Indicates the date the jewelry was assayed. Town mark: Identifies the town the item was crafted in. 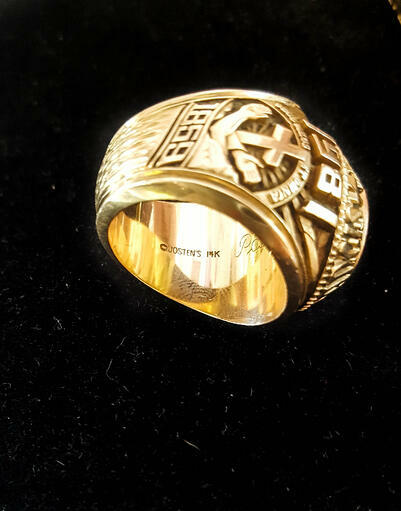 Signature and purity mark are located inside 14 karat gold ring band. Yes, sometimes stamps can be fabricated. However, in such cases there is generally some kind of purposeful mistake or fading. If you’re unsure, you can look online for listed Jewelry Maker’s Marks and cross reference yours with the already established marks. But Beware: Gold assaying wasn’t actually enforced until the 1900s. As were maker’s marks. So, you can’t find jewelry before that decade with authentic stamps. This doesn’t mean that there weren’t any stamps or maker signatures from before the 20th century, but if a seller tells that you that a stamp is from a time period before the 1900s, be skeptical and cross reference. Stamps affect the price of estate jewelry because they are a proof of authenticity. Buyers want to know that what they are paying for is real. If they are given that assurance, they will be willing to pay more. Original pieces are simply more precious and societally desired than copies, i.e “fakes.” One of a kind is always going to trump massed produced, and handmade will always be worth more than machine made. Now that we’ve got some of the easily found identifiers out of the way. It’s time to get thinking, and start analyzing what we’ve got. If your maker’s marks and date marks didn’t already tell you where the jewelry piece is from. You’ve got to figure it out by identifying key aspects that correlate to the various time periods of art. We’re not going to go into a whole history lesson here, explaining and pinpointing the distinct features of each time period and what they represent, but we will point out two key elements to consider. As styles changed throughout the eras, so did colors. Every time period has their own color palette – essentially the colors that were “in” at the time. Bracelet adorened with gems of various colors. Colors of the Renaissance were generally vivid and ostentatious. Jewelry of the time was crafted in lavish settings of gold, silver, and enamel, with rare and royal jewels. During the Late Victorian era, more subdued colors came into fashion. However, Victorians also preferred mixing colors of the opposite spectrum for high contrast. Interesting to Note: jewelry became lighter during the Victorian age to fit with women’s new active lifestyle. Which means, that a lot of the jewelry from that period is smaller and more delicate than jewelry from previous years. Retro colors are mainly categorized as being less saturated. Think: muted oranges, yellowish-browns and off-whites. No bright colors. Good to Know: retro jewelry is usually BIG and elaborate. Jewelry hardware, as in clasps and fittings, is one of the best signifiers of the piece’s time period. Just like any technology, certain hardware simply wasn’t invented until its respective time. Which means, that if you have a bracelet with a lobster clasp, there’s no way it could be from the Renaissance because it just didn’t exist back then. Tip: Georgian jewelry pieces adorned with gemstones were often set with closed backings to help the gems shine even by candlelight. So, if you have a piece with gemstones, pay attention to whether the setting is fully closed or not in the back. 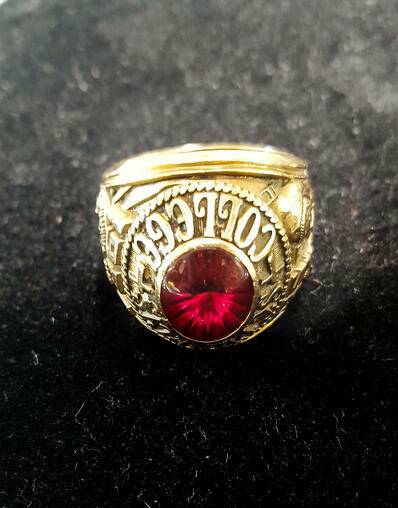 Ring with partially open backing. If you can memorize and recognize a few of the different jewelry mechanisms, that can be a sure way to catalog jewelry according to time period. Some Clasps to Know: C clasp, Trombone clasp, Foldover clasp, and Snap clasp. Bracelet with 14 karat gold box tap insert closure. If you’re considering making collecting estate jewelry a hobby of yours, or simply trying to sell estate jewelry you already have, it’s a good idea to familiarize yourself with the various art timelines and styles. This way, you can easily decipher what you’re dealing with. Yes, it can be a lot of work, but the rewards are plenty and worthwhile. So, the next time you see one of those "Estate Jewelry for sale" signs, don't be afraid to check it out and show off some of that new and snazzy information you just learned! 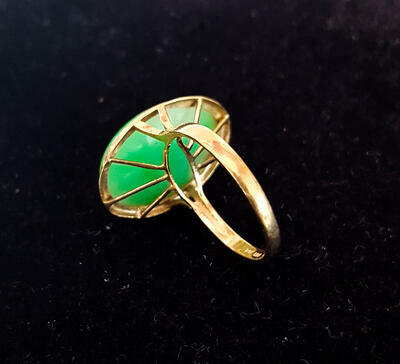 If you're having trouble identifying your estate jewelry, or simply want a professional opinion, feel free to schedule a Free Appraisal with Luriya!